Santa Cruz, CA –Island Conservation announced proven conservation leader Dr. Karen Poiani’s appointment as the organization’s next Chief Executive Officer today. Dr. Poiani will be guiding Island Conservation’s next era of growth in biodiversity conservation, island restoration, and extinction prevention. Island Conservation’s board of directors conducted a six-month search to recruit some of the best eligible candidates to lead the global organization, whose mission is to prevent extinctions by removing invasive species from islands. We are delighted to announce Karen’s appointment as our next CEO. Karen is an innovative and aspirational leader. Her scientific credentials and strategic leadership at global, regional, and local-levels speak for themselves. Karen is well-suited to lead Island Conservation’s growth. I know the board and staff share my excitement to work with Karen to protect our world’s most vulnerable species. Karen has diverse leadership and management experience including roles as chief conservation strategy officer, director of science, evaluation and learning director, conservation program director, gender and diversity leader, as well as courtesy assistant professor. She spent 17 years with The Nature Conservancy and reached the ranks of the organization’s global executive team. Most recently, Karen served as director of evaluation and learning at the Gordon and Betty Moore Foundation, where she gained invaluable understanding of the philanthropic giving sector. I have been an avid supporter of Island Conservation for many years. This highly-respected organization is poised to move to a new level of influence and impact. I am honored and excited to combine my experience and passion for conservation with this team and its proven track record. My professional training, experience, and personal passion have paved the way to this exciting post; it’s the perfect culmination for me both personally and professionally. Dr. Poiani succeeds Bill Waldman, a 37-year conservation and social service non-profit veteran who recently announced his retirement. Under Karen’s leadership, we look forward to many great years of working to curb the sixth mass extinction. We expect our partners and friends will give Karen a warm welcome to the Island Conservation family and support her and the entire team in our tireless endeavor to prevent extinctions. Dr. Poiani’s official start date is July 5, 2016. She will split her time between Island Conservation’s Headquarters in Santa Cruz and a new satellite office on the San Francisco peninsula. Her first order of business will be meeting with existing and potential donor and project partners in the Bay Area and around the world. 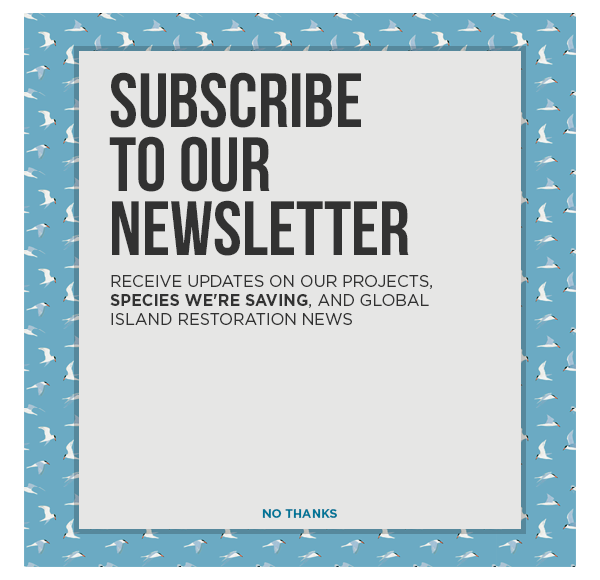 Island Conservation (IC) is our world’s only global, not-for-profit conservation organization whose mission is to prevent extinctions by removing invasive species from islands. We work where the concentration of both biodiversity and species extinction is greatest – islands. Removing a primary threat – introduced invasive vertebrates – is one of the most critical interventions for saving threatened plants and animals and restoring island ecosystems. Once invasive species are removed, native island species and ecosystems recover with little additional intervention. Over the past 22 years, Island Conservation and partners have deployed teams to protect 994 populations of 389 species on 52 islands. IC is headquartered in Santa Cruz, CA with field offices in Australia, British Columbia, Chile, Ecuador, Hawaii, New Zealand, and Puerto Rico.